For my parallel project I have researched artists and the works they made when travelling , looking in particular at artists travel sketchbooks. As part of this ‘project’ I have made copious sketches myself when travelling. See Travel Sketchbook. To act as a combining force for these sketches I have mapped out my journeys (for the longer trips, excluding local trips). Google Timeline has been of assistance when noting the dates and distances traveled. 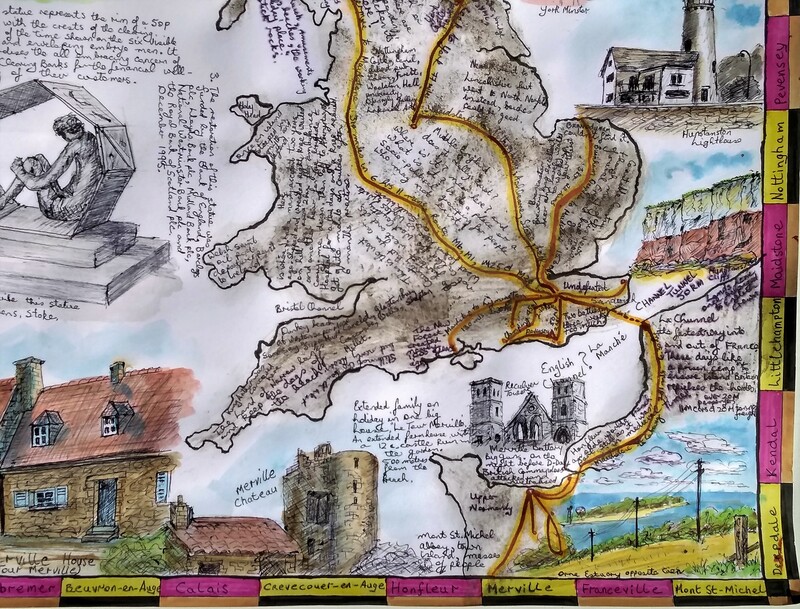 This map of the UK and northern France notes the journeys to Normandy – France, Norfolk, Scotland – North Coast 500 as well as Skye, northern and central England as well as more local trips to Hampshire , Kent and Sussex. This 50 x 65 cm (slightly larger than A2), drawing is primarily drawn, written and notated in (coloured) ink [pen, biro and brush]. However, additionally, to give it a sense of authenticity I have ‘coloured’ the land masses in road dirt and grit removed from the wheel arches of the vehicle which has undertaken the majority of these colourjourneys. So in a sense it’s not just the map which is a record of our journeys but the ‘pigment’ (road dirt) colouring / tone is also a record of our journeys. This road dirt is a bit powdery and loose on the surface. To increase the adhesion of the road dirt to the paper surface I have over-sprayed with hairspray to help hold it in place. This may have resulted in some ink bleeding in places. 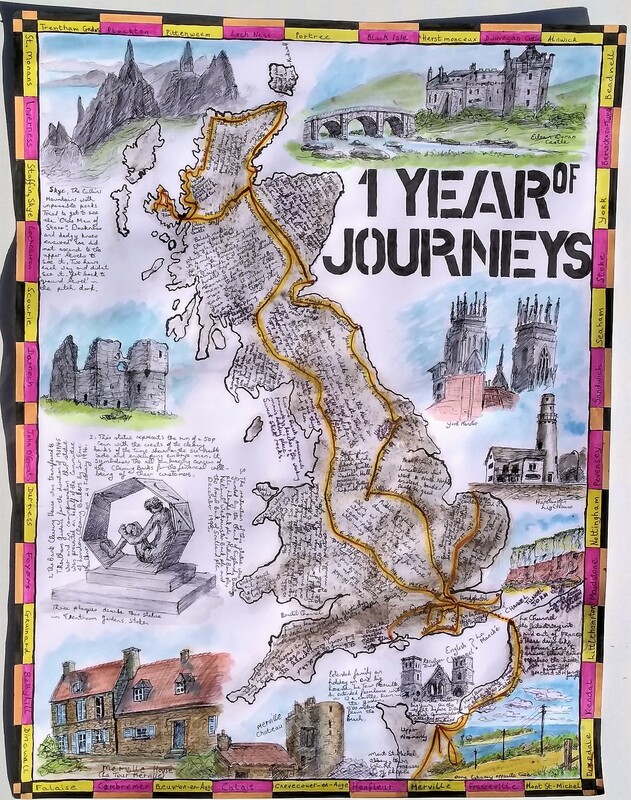 Much as Stephen Walters uses his ‘maps‘ to Illustrate his views and experiences to a place I have used this map to illustrate and note our experiences, thoughts and travels for a year travelling.